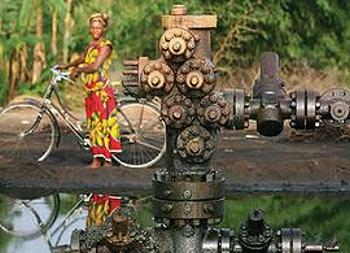 LONDON, UK, October 5, 2011 (ENS) – Oil giant Shell has contributed to human rights abuses in Nigeria by funding armed militants, who are implicated in the killing and torture of residents in the oil-rich Niger Delta, finds a new report published by a UK nongovernmental organization. The report, “Counting the Cost,” covers the period from 2000 to 2010. It was researched and written by Ben Amunwa of the London-based charity Platform, which campaigns for social and ecological justice. The report alleges that Shell’s routine payments to armed militants exacerbated conflicts and caused violent incidents in the Niger Delta. One incident resulted in the destruction of Rumuekpe town in Rivers State, where it is estimated that at least 60 people were killed. According to Platform’s report, Shell continues to rely on Nigerian government forces who have perpetrated systematic human rights abuses against local residents, including unlawful killings, torture and cruel, inhumane and degrading treatment. A company manager exposes structural problems with Shell’s ‘community development’ program, claiming that “the money is not going into the rightful hands,” and that poor community engagement caused Shell to shut down a third of its oil production in August 2011 after 12 oil spills in the Adibawa area. Shell has disputed the report, defending its human rights record and questioning the accuracy of the evidence, according to the company’s London office. At the same time, the company says it will study the report’s recommendations. Platform says its researchers have heard testimony and seen contracts that implicate Shell in regularly assisting armed militants with lucrative payments. In one case in 2010, Shell is alleged to have transferred over $159,000 to a group “credibly linked to militia violence,” the NGO says. One gang member, Chukwu Azikwe, told Platform researchers, “We were given money and that is the money we were using to buy ammunition, to buy this bullet, and every other thing to eat and to sustain the war,” adding that his gang and its leader, S.K. 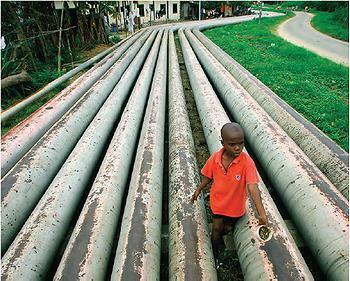 Agala, had vandalized Shell pipelines. “They will pay ransom. Some of them in the management will bring out money, dole out money into this place, in cash,” said Azikwe. The NGO coalition backing the Platform report includes Centre for Environment, Human Rights and Development, Friends of the Earth Netherlands/Milieudefensie, Environmental Rights Action/Friends of the Earth Nigeria, Social Action, Spinwatch and Stakeholder Democracy Network. Platform’s report blames the Nigerian government for failing to protect the rights of its citizens and urges President Goodluck Jonathan to find political solutions instead of military responses to the Delta crisis. 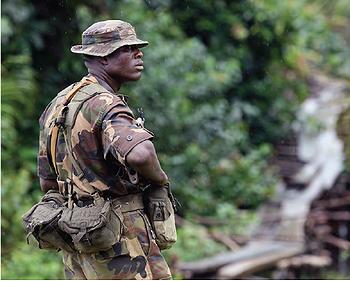 Shell’s close relationship with the Nigerian military exposes the company to charges of complicity in the systematic killing and torture of local residents. Testimony and contracts seen by Platform implicate Shell in regularly assisting armed militants with lucrative payments. In one case from 2010, Shell is alleged to have transferred over $159,000 to a group credibly linked to militia violence. Shell’s poor community engagement has provided the catalyst for major disruption, including one incident that shut down a third of Shell’s daily oil production in August 2011. “In the absence of proper supervision and controls, Shell contractors, including multinationals like Halliburton, Daewoo and Saipem, have replicated many of Shell’s mistakes,” the report states. Platform’s report follows months of turmoil for Shell. Court hearings continue in The Hague in a lawsuit by Friends of Earth and four Nigerian victims of Shell oil spills. Shell admitted liability for two massive oil spills in the Ogoni community of Bodo in 2008 to 2009 after a lawsuit filed in London. The company now faces a compensation payout estimated at $410 million and could be forced to clean up the damage, Platform reports. The Ogoni have suffered from five decades of severe environmental devastation and Shell has a long legacy of pollution in the region. According to UNEP, restoring Ogoniland could require the biggest cleanup operation in the world, dwarfing BP’s response to Deepwater Horizon, and could take up to three decades to complete. Under Nigerian law, Shell is obliged to clean up all oil spills regardless of the cause, but compensation is not available for victims where an oil spill has been caused by sabotage. “In order to minimize its liabilities, Shell maintains that 90 percent of the oil spills are due to sabotage,” says Professor Jedrzej George Frynas of Middlesex University, who believes that false claims of sabotage are common by oil companies in the Niger Delta. Dr. Frynas will be one of the featured speakers at the Oil Politics in Africa Conference on November 16, 2011 at St. Mary’s Guildhall, Coventry, England. Jimmy Ahmed, general manager of business and government relations, Shell Petroleum Development Company of Nigeria is also scheduled to speak.